A ShopRite store is coming to a notable food desert in Northeast Philadelphia. Ammons Supermarkets LLC will operate the store, which will have its grand opening in the Wissinoming section on Sunday. The Ammons family also owns ShopRite of Aramingo Avenue and a ShopRite store in Mullica Hill. 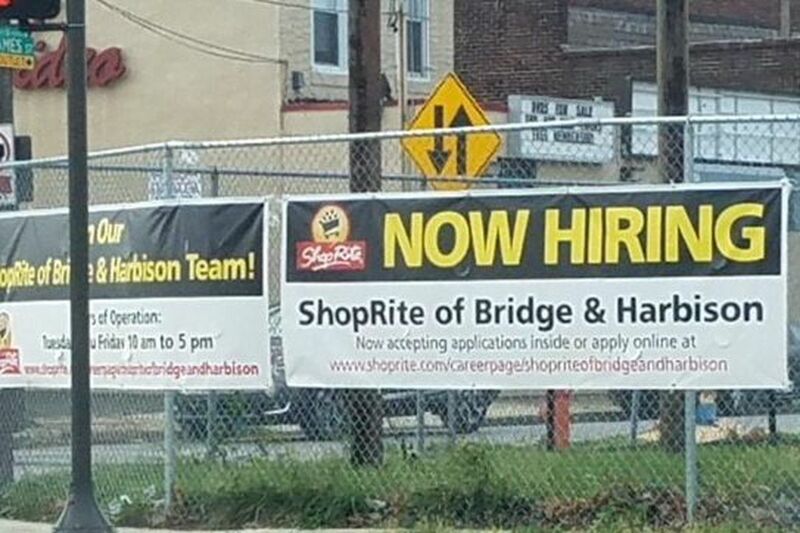 Located at 5597 Tulip St. at Harbison Avenue, ShopRite of Bridge and Harbison will anchor the new $29 million Shoppes at Wissinoming and employ 300 full and parttime people. It will give residents access to fresh produce, seafood, and groceries in a low-income area that the government says has lacked healthy and affordable foods within a half-mile. Peter Ammons, who works with his father, brother, and sister in the family's supermarkets, said the project happened in spite of the January 2017 sweetened beverage tax, which has been blamed for depressing soda sales and cutting into merchants' profits. "Despite the challenging business climate in the city since the beverage tax was implemented, our family made a decision to move forward with this new store and keep our commitment to the community," he said in a statement. Supermarkets throughout the nation are facing enhanced competition. New entrants including the German firms Lidl and Aldi and Amazon's purchase of Whole Foods have spurred stores to add services, such as home delivery of groceries. This ShopRite will have no grocery competitors within a half-mile, and will not do home delivery. It will include a large selection of produce, bakery and floral shops, seafood and meat departments, and lots of organic and store brands such as ShopRite's Wholesome Pantry line. An nutritionist will offer free one-on-one consultations, store tours, and meal planning. An AT&T Store last week joined an already open Blink Fitness at the center, while a new Wawa is coming nearby. The ShopRite project began five years ago and received state and city tax credits along with support from the federal Healthy Food Financing Initiative, the first coordinated federal government effort to eliminate food deserts around the country. The area was identified as one that lacked a full-service food grocery store, said Candace Young, associate director of research and evaluation at the Food Trust, which has worked to end food deserts. "We think every community should have a full-service grocery retailer," Young said. "We still have some gaps to fill" in the area. Young emphasized the importance of affordable fresh food, since access only goes so far if residents can't afford the merchandise. "In my conversations with workers in the area, they say 'This area really needed it,'" Young said. This store is also the subject of a study by researchers at the University of Delaware, who will evaluate the store's effectiveness and impact on the area, Young said.